Come out to learn more about the garden, become part of the community, and enjoy being in nature, right here in Pleasant Hill, at garden work parties, events, and classes! Garden Work Parties are continuing at PHIG! As a community partner, PHIG participates in Sustainable Contra Costa's Community Resilience Challenge. The 2018 Challenge community project, in collaboration with Friends of Pleasant Hill Creeks and the Watershed Forum, is conducting a Grayson Creek site assessment behind the Pleasant Hill Education Center. The site assessment includes observations, monthly water quality monitoring, regular trash pickup and summer creek cleanup to be done by PHIG volunteers, students, and summer teen camp participants. 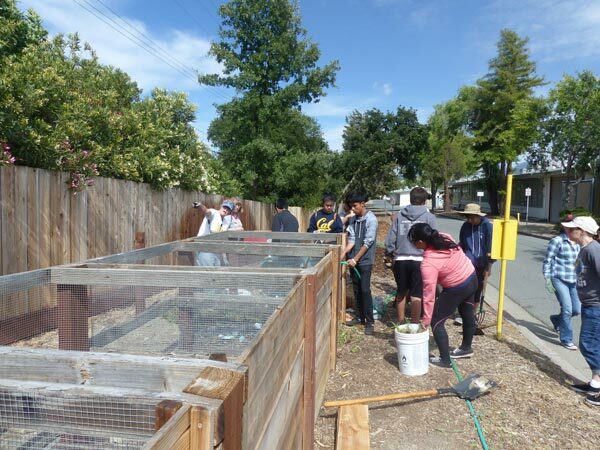 Previously one of PHIG's actions as part of Sustainable Contra Costa's Community Resilience Challenge was to build native bee houses which are used at PHIG and in the neighborhood to increase nesting habitat for these small native bees. Keep us posted on what happens to your bee house! Print information and directions to build your own.